I guess it’s official then. Without my knowledge, the publishing of my first post in my new home of bloggery (yes, I think I just made that up), the seed of my new blog-dom, if you will, seems to have marked the official end of my summer. Since I’ve arrived, I think I’ve stealthily tried to hold off getting completely acclimated to my re-relocation to home – Metro Manila, Philippines. I’ve taken my sweet time getting over my jetlag, and have still to finish the purging of my stuff/junk in my bedroom or put new things up on the walls. And despite my previous yearning (after months of traveling and downsizing my collection of belongings) to unpack my suitcases once and for all, there are still little pockets of my luggage barely out of their bags, still rolled up to save space. And though I continue to allow many fibers of my being to deny the reality that for the first time in six years, I have no idea when I will be leaving or moving next, I am excited to stay put for a little bit. It’s a beautiful but also fearful thing to be returning to my roots and digging deep down into this Filipino soil for community. My summer was a little over twelve weeks long. It began when I moved out of Wheaton and culminates now in daily rain showers in the South East Asian monsoon season. In between all of that I stomped lightly around the East Coast of the United States. During the summer weeks, many friends and new acquaintances inquired about what I was doing with all the time I had. I was certainly unemployed, but never bored out of my mind. I took the necessary time and effort one needed to simply be. I never allowed myself to long to be any other place than where I was at that moment. It was wonderful. I was traveling. I was making new friends, and learning so many lovely things about old ones. I was beginning to fall in love with cooking. I was going for morning jogs and doing evening yoga in the living room (or the backyard of any home I was visiting). But I think mostly I was day dreaming and catching up with myself. I was writing. I wrote many deserved thank you letters to friends and mentors, cards and postcards for people I treasure. And I happily mailed them off! 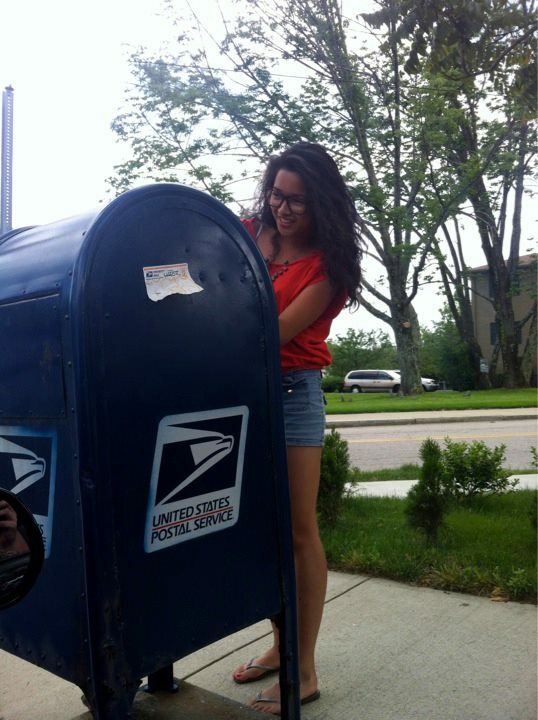 My friend Bri captured the first time I ever dropped mail off at a US mail box back in June- all these years I would always go to the post office. I was thrilled! In my flitting about this summer, it seemed that at every turn I was showered with good favor. Not to say that I was favored by people, but that I was gifted with good company and genuine, quality time with friends, nature, my thoughts, and God. I hope that in the next few months I might be able to share more about some of those moments, because collectively, they made the end to my college story a ridiculously sweet one, and completely worth all the trouble. I was barely awake so early in the morning, but seeing the photo made me a little sad. The caption reads, “This morning, we quietly bid farewell to our beloved Twisted Sisters. 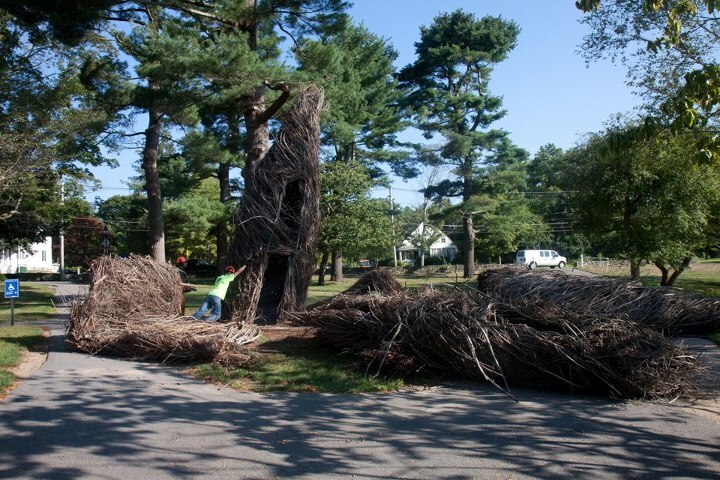 The Patrick Dougherty sculpture sustained some serious damage this summer and upon close inspection we reluctantly decided to remove it for safety reasons. The piece has been a permanent fixture and focal point on campus since 2008 and we will certainly miss it. Patrick Dougherty had told us that his sculptures usually have at least 2 to 3 good years and are probably kept up for no more than five. The photo was another reminder that I am in a season of new beginnings and new stories. Unfortunately in the process, many things must also be put to rest. My first year seminar at Wheaton was one of the lucky groups of students to be able to work on the building of the sculpture four years ago. We were tentative freshmen, taking an art class on drawing and 2-d design, and each of us were required to work a number of hours on the project. I worked one of the first shifts and spent my time sorting the long saplings and being one of four people collectively driving a large drill into the ground for the foundation. I have virtually no memory of Wheaton before the life of this sculpture. It has joined my class in our coming and again in our departure. However, it is without doubt I know that many things I’ve learned, bonds I have formed and dreams I have sowed, have a life span of more than just two to three years good years and will endure way beyond just five. And so it is the end of the summer. My mind is whirring with ideas and I am working on multiple projects, each so distinct from the next one. For once I am no longer between staying and going, arriving and leaving. I am simply, for now, staying.